HarryStylesFan.org :: Harry Styles :: Your Ultimate Harry Styles Resource » NEW LAYOUT! Loads of new pages! By Maja on February 2,2012 • 2 Comments on NEW LAYOUT! Loads of new pages! NEW LAYOUT! Loads of new pages! If you’re reading this on tumblr, please click the image above. Yes! 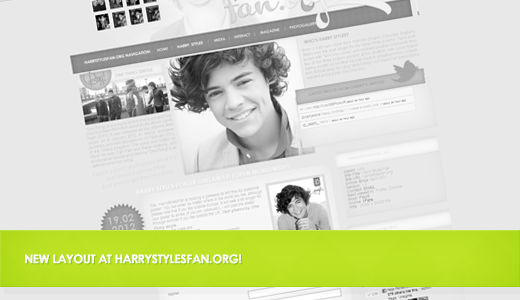 Finally, HarryStylesFan.org has a new layout! It was made by the lovely and talented Skyler. We hope that you will carry on visiting the site. Also, HSF has some new pages for you! There’s the media page, with loads of fan-art, icons, wallpapers; an interact page with loads of fun stuff, like puzzles or quizzes; a magazine, which is still coming soon!